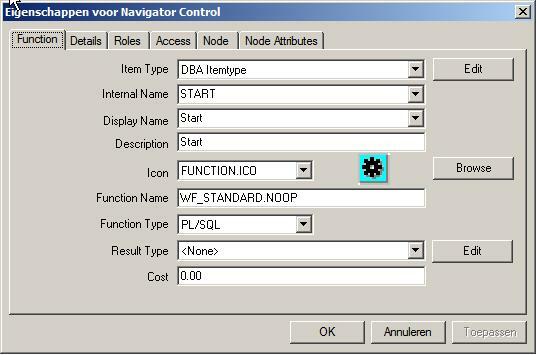 For many eBS-DBAâ€™s workflow is a strange and hardly understood module. Still it is widely used in 11i and 12i. So letâ€™s dive into itâ€™s workings in more detail. This is part one of a series of 3. During this series, I used a 11.5.10 instance on a 9.2.0.8 database. The basics will still hold for earlier and later versions, but small modifications may be needed. In this part we go into the definitions and the basics of Workflow. We start with some definitions, then build a simple basic workflow. And we see how this relates to the wf_tables in the database. That set is a definition of a workflow. That definition in Oracle is called a â€˜processâ€™. The nodes in the process can be functions, processes or notifications. All these are grouped together in containers that Oracle called an â€˜Itemtypeâ€™. The itemtype is very important, since it will become part of the primary key in the underlying tables. The actual workflows that are running according to the definition of the itemtype are called â€˜Itemâ€™s. The item is started as an itemtype and a process. And it is uniquely identified by itemtype and an itemkey. Every process consists of 2 or more nodes, that are joined together by transitions. At least 2 nodes are required, because a process needs a â€™startâ€™ and a â€™stopâ€™-node. Ok. Enough talking. Letâ€™s build a process and find out the rest along the way. By the way. All the definitions above will be linked to a glossary later on. To start building our process, we first need the itemtype. On rightclicking the untitled map, we can create a new itemtype. Internal name is the unique name that will be used in the table keys for this itemtype and itâ€™s items. It is limited to 8 characters. So choose wisely! The descriptionâ€¦â€¦.. you can guess that one. I choose to start building a flow that will do some DBA checks and tries to fix problems or notify the DBA if there is a problem. During the course of building this flow, weâ€™ll stumble on different features of the workflow engine. The first step is to build the itemtype. I called it: DBA_TYPE. Because this is a process that we will only be calling from our client, we have no use for the result typeÂ at the moment. Later on, weâ€™ll see nested processes, where the result of a process will determine the direction of the calling process. When we go to the Process Detail (right click the process). We again have a virgin drawing board. This will be where the actual flow is created. Every process consists of activities (functions, notifications and processes) and the transitions between them (based on the results of the activities). Also every process has to start with a â€˜Startâ€™ Activity and finish with an â€˜Endâ€™ activity. (Take care to avoid loose ends, since the end finalizes the flow and gives back control, or makes the flow purgeable). Note the wf_standard.noop for the function. This is a dummy function. Because the only purpose of this node is to indicate the starting point for the process. Even though we named this function â€˜STARTâ€™, we still need to flag it as a â€˜Startâ€™ function. That is in the node tab. Â We then create an â€˜ENDâ€™ function in the same way. Now we have an item_type with 1 process, and 3 functions. Time to connect the functions together. Right click START, and drag to INITIALIZE_FLOW. Then right click there and drag to END. Now we have a runnable flow. You can even start it already, if you create an empty packaged function: XXX_WF_DBA.init. First we are going to see how this is recorded in the wf_ tables in our database. But that is part 2 of our series. This entry was posted in eBS, Oracle, Workflow and tagged item, item_key, item_type, Oracle, process, terminology, Workflow on July 20, 2009 by Arian Stijf.